Spotted dolphins are born without spots, then develop spots throughout their lives in unique patterns. Photo credit: Dolphin Comunication Project. 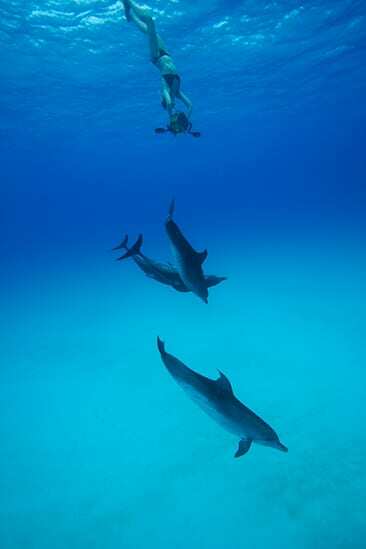 Kel Melillo Sweeting records Atlantic spotted dolphins, in The Bahamas, using DCP’s specialized video/acoustic array. Photo credit: Al Sweeting Jr.
Do you ever look up at the night sky and search for your favorite constellation? Look over at your freckled friend’s arm and find a pattern of speckles? We get to do this very thing – with dolphin spots! As researchers with the Dolphin Communication Project (DCP), we work to promote the scientific study of dolphins and inspire their conservation. We find one of the ways people become the most excited about a creature that lives, essentially, in another world, is to show dolphins as individuals. Which is, of course, exactly what they are. We are privileged to collect acoustic, video and photographic data of wild dolphins off the coast of Bimini, The Bahamas. That’s right; while others go to Bimini for big game fishing, SCUBA diving, bonefishing and more, we are there documenting and researching wild Atlantic spotted and bottlenose dolphins. We use natural markings to recognize individual dolphins; this is called photo-identification. We do not need to disturb the dolphins with tags, just snap some images and spend a lot of time trying not to go cross-eyed noting patterns! Each dolphin’s spots are unique, like our fingerprints; however, they gain new spots throughout their entire lives, so we aim to capture – on camera – as many dolphins as we can each year, so we can note their newest spots. Atlantic spotted dolphins are born without spots. So normally, during our first observations of a new member of the group, a calf looks just like every other calf. We make note of its mother, who it will spend virtually all of its time with, and keep a close eye out for injuries and new spots. Once we’re confident a marking, whether an injury or a spot, is permanent, the dolphin is given a unique ID number. And so begins our years of following that individual – who does it hang out with? What does it play with? What sounds does it make? If female, when does she have her first calf? This information is then funneled into both scientific studies and presentations and education programs. And during our education programs, a young adult female dolphin isn’t just an abstract mammal trying to make it in the ocean. She isn’t even just DCP ID#35. She’s “Lil’ Jess.” And we’ll tell you lots about her. And her friends. And we’ll hope that you’ll want to protect them. Interested in learning more? Our website (www.dolphincommunicationproject.org) is full of educational information and stories from the field. Our Adopt-A-Wild-Dolphin program is an accessible ($30-35) way to learn more about a specific Bimini spotted dolphin as well as dolphins in general. You receive a biography, photographs and video to enjoy and share. Or, sign-up for our May 2017 Field Course in Cetacean Ecology with Sacred Heart University. You can also become a member of DCP! The author is a researcher with the Dolphin Communication Project, a U.S. 501(c)3 organization based in Port Saint Lucie, FL. You can follow their research and education efforts at www.dolphincommunicationproject.org as well as on Facebook, Twitter (@dolphincommu) and Instagram.